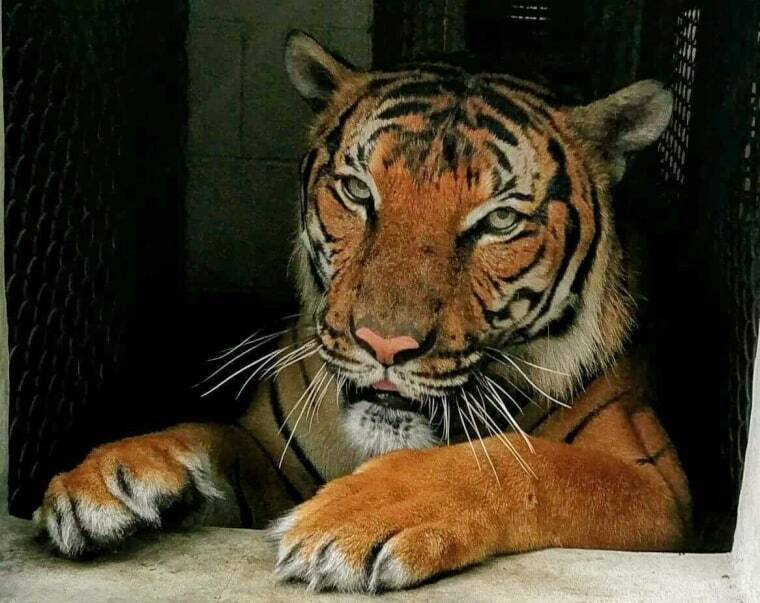 The Palm Beach Zoo tiger who made headlines last year after mauling a zookeeper has died at 14. The Malayan tiger, Hati, had an initial surgery after a routine ultrasound showed "irritation in his guts," the zoo’s associate curator Nancy Nill said in a press release statement. During his recovery from the procedure, a staff member noticed an “abnormal bulge in his abdomen” that continued to grow, necessitating a second surgery. The zoo’s Media and Public Relations Manager Naki Carter said after Hati’s emergency surgery on Thursday the surgeons did not think there were any other issues. But, while Hati was recovering Thursday evening he stopped breathing and surgeons could not resuscitate him. Hati became well-known last year when he mauled and killed a zookeeper named Stacey Konwiser who had worked at the zoo for three years with her husband, according to NBC affiliate WPTV. In April of 2016, Konwiser walked into an enclosure labeled “accessible” by the tiger. She was fatally bitten on her neck and had claw marks, punctures and abrasions on her shoulders and back. After the attack, Hati was tranquilized. Although police reports confirmed the name of tiger responsible, Carter stresses the zoo never reported the name of the animal out of respect to the family. “Hati has suffered from a lot of health concerns and health issues that are common in cats when they get up there in age,” Carter said. She added that his issues since April have included dental problems, ear aches and gut and intestinal concerns. The zoo monitors the animals regularly for dental cleaning, general check-ups and to give them any needed medicine. Carter said nine days ago an ultrasound alerted doctors that something was wrong in his abdominal area and an initial surgery was needed. Hati was under close watch afterward and appeared to be doing better until the bulge was noticed. Doctors at the zoo’s Melvin J. and Claire Levine Animal Care Complex called for emergency surgery. Carter said the bulge was in the same area that was stitched up after the first operation. But, she added that, following the surgery, nothing was wrong and Hati was recovering. A necropsy will be performed on Friday to determine the exact cause of death, Carter said. The tiger arrived at the Palm Beach Zoo in July of 2015 from Texas after being recommended for breeding. “As of last year, there were only four male tigers older than Hati, out of 38 male Malayan tigers in AZA accredited zoos,” the zoo reported. Carter said the zoo has three other Malayan tigers.